#stampinup #faithfulinkspirations I hope you've been enjoying my week of sharing Stampin' Up's "Rooted in Nature" stamp set and the awesome "thinking of you" sentiment stamp. I love that bold, graphic font and I love pairing it with the beautiful trees in the stamp set. Today's card is another "inspired by" card. This time it's inspired by a card made by Dawn Olchefske--who has inspired loads of other similar cards. I did mine just a little differently than Dawn. She's a master at sponging on color. Me? Not so much. So I used Watercolor Paper to make my ombre strip of color. I started with a 3-3/4" by 5" Watercolor Paper panel. I used painter's tape to mask off a strip where I'd place my color. I used the waterfall stamp from the "Waterfront" stamp set to apply, from the top, Night of Navy, Mossy Meadow, and Pineapple Punch inks. Then I used my Aqua Painter to blend the colors. 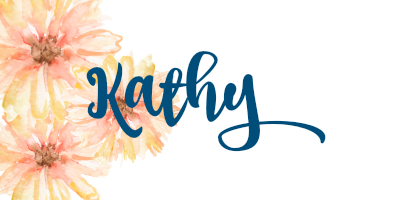 Because I am the world's most impatient stamper, I used my Heat Tool to set the colors. When the ink was set, I carefully peeled off the painter's tape and then used my Stamparatus to stamp the "thinking of you" sentiment in Memento Tuxedo Black Ink. I used the Stamparatus because the Watercolor Paper isn't smooth, so it takes a few times to get a solid image. Clever, huh? I also set this with my Heat Tool. Then I adhered it to a 3-7/8" by 5-1/8" Night of Navy mat and then onto a Thick Very Vanilla Card Stock card base, cut lengthwise. 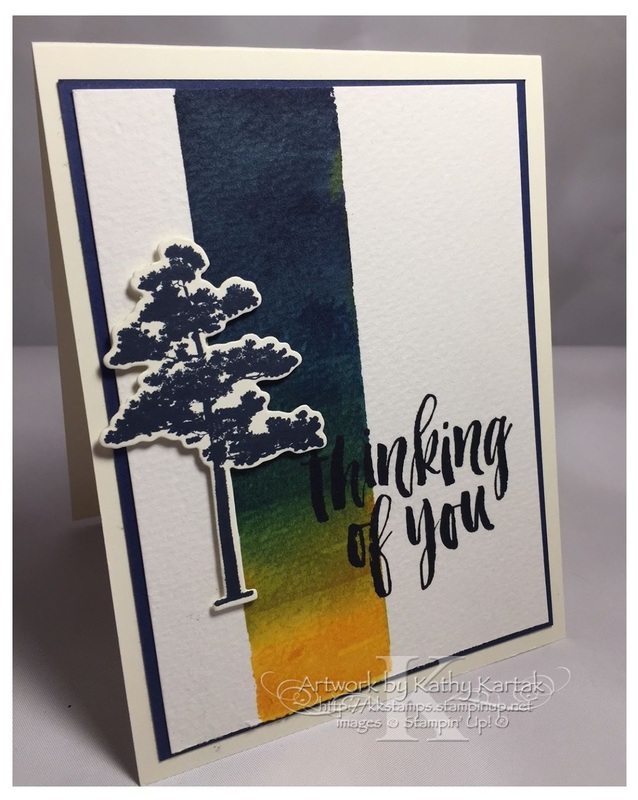 I used the Stamparatus to stamp the tall tree from the "Rooted in Nature" stamp set onto Very Vanilla Card Stock. I stamped it first in Night of Navy Ink and then in Memento Tuxedo Black Ink. I wanted a dark, dark navy tree to stand out against the bold background. And, yes, I set this with my Heat Tool before cutting it out with the coordinating Nature's Root Framelit. I adhered the tree to the card with a combination of regular and Mini Stampin' Dimensionals. Next week I'll be sharing some cute cards made with the Animal Expedition Suite of products. Come back and see what I have in store for you! !